And we are at 36 weeks, as of this past Tuesday! We are going to the doctor's every week (and sometimes twice a week!) just to make sure everything is going okay and the baby and I are healthy. In the meantime, I have assembled several freezer meals for post-delivery. We plan on using these after the baby is born and the inevitable day that I go back to work. Boo. There are SO many freezer meal lists, recipes, advice, etc. out there... but none that are low carb AND specific for my picky-eater of a husband. (Love youuu Todd!) So here we are. I raided my recipe binder, other recipe sites, and even "stole" some friends' recipes to make this collection. Let's go! Even permanent Sharpie rubs off. This specifically happens on hot or cold foods due to the moisture/condensation. Make sure you write what you need to write (what the food IS, the date it was made, and any cooking instructions) on the bag or foil before you put the food in. And let it dry also, before you put the food in. I also wrote the info on a post-it or index card and then slipped that in between the foil containers and Press'n Seal. 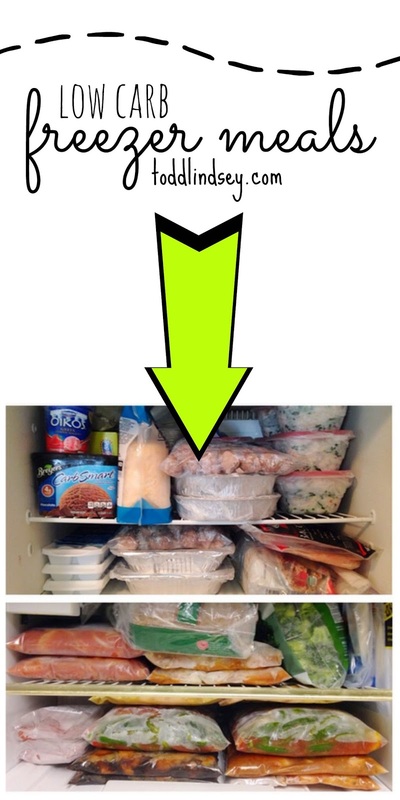 To help avoid freezer burn and all that extra, extra ice that creeps it's way into your food, double bag food items that may have extra air in the bag. I also use a layer of Press'n Seal around any aluminum or plastic containers, even if they are already freezer safe. And lastly, spend the extra few dollars on actual Ziplock brand freezer bags. I have used both Ziplock and generic freezer bags, as well as both freezer and regular storage bags, and Ziplock freezer bags win all the time! If you are making meatballs or meatloaves where the meat needs to be mixed by hand, let the meat (and eggs, and other ingredients) get to room temperature first. It's one thing to submerge your hands in freezing cold meat for one batch of a recipe- it's a totally different story to submerge your hands in a vat of cold meat with four times the ingredients! My hands were literally painfully cold for the full five minutes or so that it took to combine all the ingredients. Owwww! Stock up on lots of bags (bulk or regular sized) of low carb veggies for easy side dishes. Salads are also great sides but face it- that's more planning and prep work! Our favorite low carb steamed veggies are cauliflower, broccoli, or green beans. You can spice them up easily with herbs, spices, cheese, butter... If you like Outback's broccoli, you will love our favorite, which is broccoli with butter, parmesan, and lemon pepper seasoning! Buy in bulk! We did a Costco trip first and bought everything we could there. The remainder of the ingredients, I got at the local grocery store. Two grocery trips was worth the extra money saved! Invest in a giant mixing bowl. I am not talking about the typical 4 quart mixing bowls (which is the standard large size, in case you were wondering). I am talking about an even bigger bowl. I used a giant plastic bowl I had that is supposed to be used as a salad bowl. It probably can hold about about 6 quarts, which is the perfect size for doubling recipes in. I will also not regale you all with detailed, step-by-step instructions on how I did this. You can figure that out for yourself. Or if you can't, there are plenty of other blogs that will do that for you. However, below are the links and some short commentaries to the recipes that I used. I will try to come back in a few months with a post on how the recipes turned out, with corresponding photos. Parmesan Meatballs by iBREATHE I'm hungry I doubled the recipe so that I had two batches. I baked the meatballs so that they are precooked and put them in Ziplock freezer bags. Since they were pre-baked, I got to taste-test the meatballs. Of course, they aren't as good as "real" meatballs with bread crumbs, but they are a good substitution. I will add cans of sugar-free tomato sauce, italian seasoning, and mozzarella cheese when we go to eat them! These can be heated up in the oven, microwave, or by stovetop. Chicken and "Rice" by iBREATHE I'm hungry This one I am really excited to try out! I doubled the recipe but riced extra cauliflower. (All that effort- might as well make extra! I riced four heads of cauliflower and put the extra in the freezer to fry up with some of my other freezer meals as a side dish. I had maybe 4 cups of extra riced cauliflower.) I used the large aluminum lasagna pans from the dollar store to store these and am planning on doing the oven baking method. If you want to do the slow cooker method, I suggest freezing the rice and chicken separately, so that you can layer it the way you want in the slow cooker later. Also, I doubt it would even fit in one bag anyway. Broccoli Bacon Bake by Kraft I haven't made this particular recipe before, but I have made similar ones, both with broccoli and cauliflower (or both). I can't foresee any problems with this side dish! I doubled the recipe and put them into smaller aluminum pans. Easy peasy! I omitted the carrots for low carb and used frozen broccoli so that I wouldn't have to deal with all that blanching nonsense. Sweet Teriyaki Chicken by Six Sisters' Stuff I used Splenda instead of sugar to make this low carb friendly! Creamy Salsa Chicken by Six Sisters' Stuff This one I am probably the most unsure about how it will taste. We will see! Maple Dijon Chicken by Six Sisters' Stuff I substituted sugar-free maple syrup for regular maple syrup. I know this recipe is really yummy because a friend made it before in a freezer meal exchange! This goes great with a side of steamed broccoli. Sausage and Peppers by Ring Around the Rosies Thank you Todd for slicing the onions for me!!! I was only able to fit 5 sausages into each freezer bag batch since the onions and peppers took up so much space. I froze extra sausages to add into the slow cooker in a separate quart bag. Savory Chicken by Ring Around the Rosies This one seems pretty simple and straightforward. We will have to wait and see on the taste factor! I left the broccoli out and will add it later during the cooking process. I also substituted extra chicken broth/stock for the wine. And another thanks goes out to Todd for slicing those onions! Chicken Fajitas (1 lb chicken breast; 1 medium onion, sliced; 1 medium green pepper, sliced; 2 c salsa; 1 pkg fajita seasoning) This recipe is also from a freezer meal exchange. Our friend Kelly is an awesome cook and passed on this recipe. It's super simple (thanks for the third time to Todd for slicing all those onions!) and goes great with low carb tortillas and toppings. It does come out a little liquidy from all the veggie juices, but you can save those for another recipe (like a stock/broth) or just toss it down the sink. Not to mention, they are all low carb friendly! I also think we will be able to get two meals out of each pre-assembled meal. Yay for leftovers! And I also made a month's worth of homemade dog food for our lovely beagle friend, Banner. It looks like we will all be eating well for awhile! some of these sound very interesting. I am glad you are so in control and ready for the wonderful days to came (and the not so great ones, such as back to work). Wow! You are set! Congratulations on your new bundle of joy! She's one lucky girl to have such a wonderful Mommy. Enjoy your new little doll! My husband is diabetic, and I made frequent trips to visit my 93 year old father. I made up freezer meals to leave for my husband..breakfasts, lunches and dinners, for every day that I was gone...up to three weeks. They were single serve meals, not family meals, like yours. Basically what I would do is double the recipe for each meal I made at home for a couple of weeks before I left, and freeze half of it. Each meal I doubled gave him two meals while I was gone. Getting ready to start my freezer cooking after the holidays. Thank you so much for putting together a list of low carb meals -- this is so helpful! Were there any recipes you would not recommend after having eaten them at this point? Very nice post. I like your post. This is very useful. Thanks for sharing.